Creating subtasks is the simplest level of a task breakdown. The subtask can be considered as a smaller task, which is part of a more complex one. In other words, it is an element of completing a larger task (img.1). Subtasks are useful when you have multiple items to do on a given card to show their progress. The subtask is created at a card level and has two states: checked and non-checked. It does not inherit the card properties and can be completed by different users. 2. How to create a subtask? The Subtask tab stores all subtasks that belong to the card. Open the Kanban card and go to the Subtask tab or right click on the card to open the Context menu -> select Subtasks. 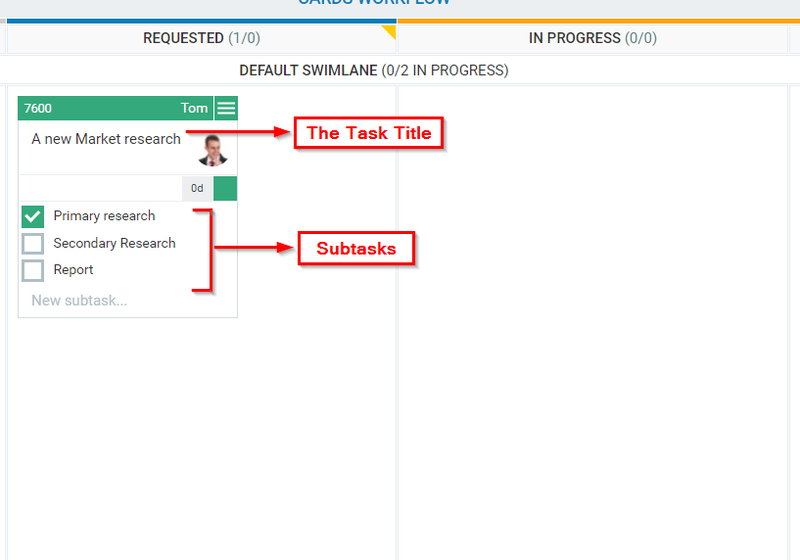 When there are no subtasks created, the Subtask tab displays a single value 0. 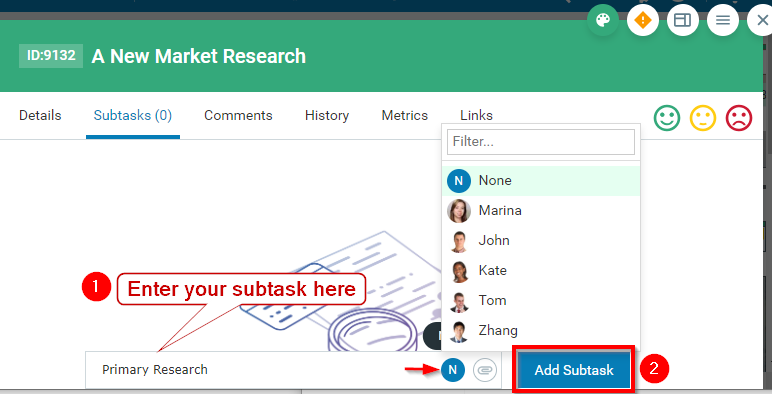 In the Subtask tab panel, users can write, post, assign, edit and delete subtasks. Enter the subtask in the text box (1) → use "Add Subtask" button (2) or CTRL + ENTER to add a new subtask to the card (img.2). You can assign the subtask to a registered Kanbanize user → select a name from the dropdown list with board assignees. Note: The subtask assignee can be different from the card assignee. You can also attach a file to your subtask -> click on the Attachment icon and upload a file from your computer/cloud storage. 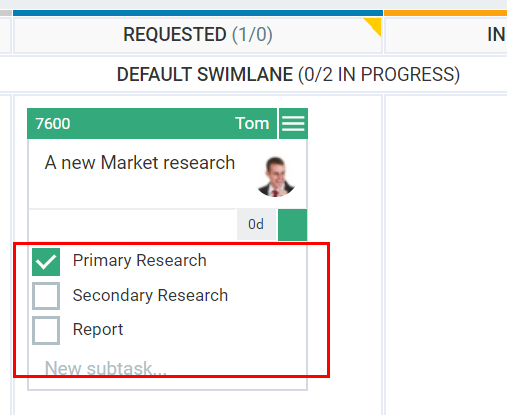 The subtasks that you have created appear as a checklist in the panel (img.3). When a user has completed a subtask, they have to tick it off in order to mark the task as completed. 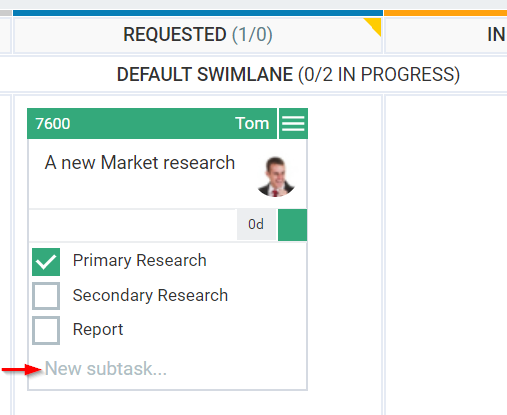 The Subtask tab displays the number of total Subtasks in the card and lets you see the number of completed Subtasks vs total Subtask from anywhere in the card. For example, when 2 out of 3 subtasks are completed the numerical fraction displays 2/3. 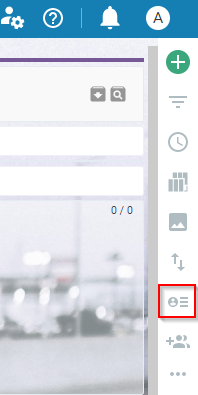 To focus on uncompleted tasks, a user can hide completed Subtasks using the button in the top right corner. Hover over a subtask to see: Subtask ID, Date/time of creation and completion. 3. How do you display subtasks at the closed card view? 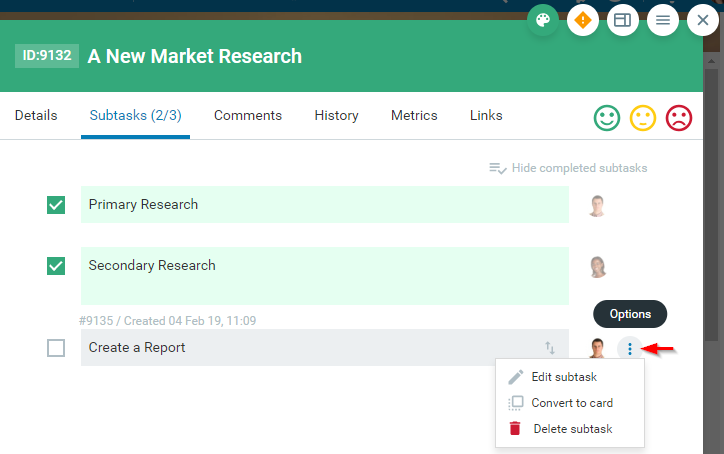 Users can configure their card view and make the subtasks visible at the closed card view. To display the subtasks at the closed card preview (img.4), please go to the sidebar at the right side of your board interface and click on the Configure Card View icon to open the Card settings panel. 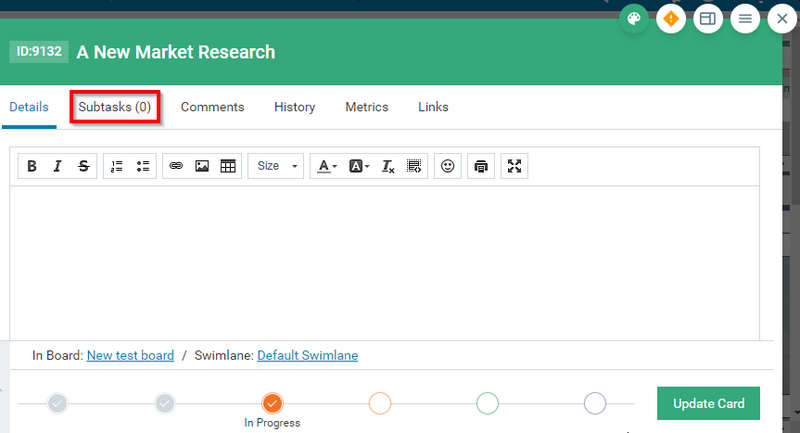 In the new configuration panel that opens -> select "Show Subtasks" -> "One per Row" - > Save Card View. Important: When you make the subtasks explicit -> the system allows you to quickly create new subtasks, without opening the card Subtasks Tab. Just enter the subtask in the "New subtask" text box (img.5) at the bottom of the card and click Enter to add it to the card. 4. How to edit a Subtask? You can double click a subtask to enable the edit mode. 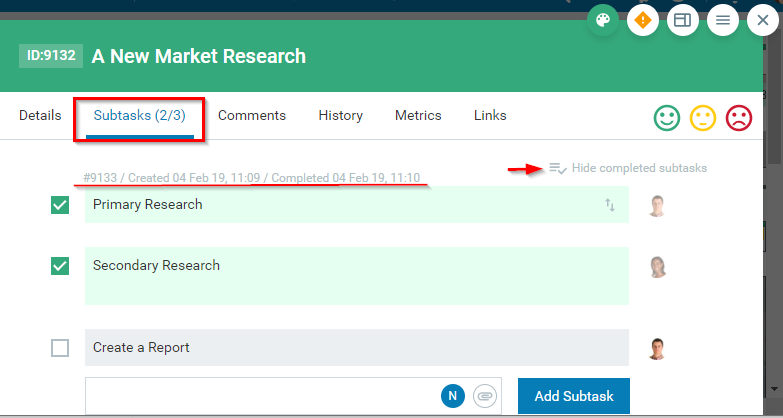 Note: If you want to edit/convert/delete a subtask that is marked as completed, you have to first remove the check mark and use the navigation described above. Please, read the next article to learn more about converting a subtask to a card.